It all started with a trip to Target. My daughter was in tow and before I knew it, I was making room for another “person” to ride home in our car. We had been careening through the aisles, aptly following my check list, when I was halted by daughter’s pleas to stop and look at the Halloween decorations. “Mommy, look at that skeleton, can we get it?” she asked. Before I could answer a memory flashed before me. It was visually blurry and tattered around the edges like a dream. It flooded me with shame and resentment as I heard my mother’s voice responding as if it were me sitting in that red shopping cart. “Don’t start! You know better! Do you think money grows on trees? 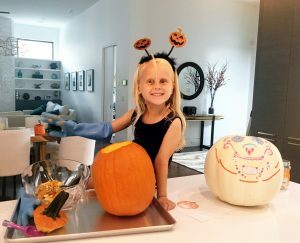 If we bought that, we’d have a dark Halloween for two months because we wouldn’t be able to keep the lights on.” The truth was, my mother had her own anxieties about money and the severe shortage of it to cover our basic needs. She didn’t know at the time that her responses (now called shaming) would result in me feeling unworthy. That I would internalize it and feel undeserving or greedy for wanting (even though all of us want things). As a child, I often felt powerless over my desires, feeling resentful and deprived; all those riches lined up on the shelves were for other people, but not for me. The National Retail Federation estimates Halloween spending to reach $9.1 billion this year. The second highest in the survey’s 14-year history (https://nrf.com/media/press-releases/halloween-spending-reach-9-billion) For all intents and purposes, it may very well be considered the beginning of the Holiday Season. 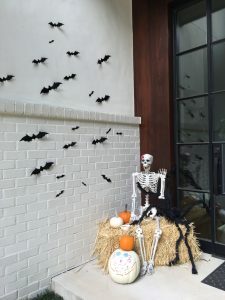 I don’t need to know these statistics to see that every other home on my street is staunchly decorated with spider webs and fake graves, while others have pumpkins, spiders and skeletons. The spirit of the season is in full swing and my daughter is wondering where is ours. I have a confession to make, but you might have guessed it already. I’m anti-decorating. It doesn’t matter to me which holiday it is, if it requires spending money on frivolous inanimate objects that I have to put up for someone else’s enjoyment and then take down again, count me out. I could implore you with reasons about how we live on a busy street and that we don’t get trick or treaters, but the truth is we’ve never actually been home for Halloween because we’re out trick or treating in someone else’s neighborhood. 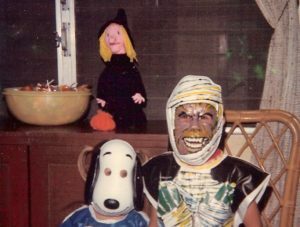 Or I could reach for the old adage, when I was a kid, our Halloween costumes were plastic faces and jumpsuits that tied in the back. We were lucky to have a Tupperware bowl of candy to give out and used pillow cases for trick or treating bags. As my mother’s voice drifted off and I saw the glee in my child’s eyes, it occurred to me where this belief was rooted. My childhood is not hers, nor are the economic circumstances of that time. We could afford to deck our home out like a Griswolds Halloween, but does it mean we should? Material cravings are often a way for us to channel deep needs that aren’t being met, such as the need all humans share to be truly seen, accepted and cherished. Often, when we feel guilty that we aren’t spending enough time with our kids, we buy them things. When our child gets demanding, that’s a red flag to stop, drop our busy-ness, and get clear about our priorities. It is often said that children thrive when we give them half as many presents and twice as much of our presence. However, none of these things applied to my daughter in this moment. We are fortunate to spend a lot of quality time together and most trips through a toy store or Target result in taking photos of things she desires and adding it to an imaginary birthday list. My responses are typically, “Wow, isn’t that cool?….It’s not in our plan today. I’m sorry, I know that’s hard for you. I see how much you like it. Let’s take a picture and add it to your birthday/xmas list.” But this wasn’t about another toy, this was about wanting to be part of the joy and excitement of Halloween. Something I had dismissed without realizing it. 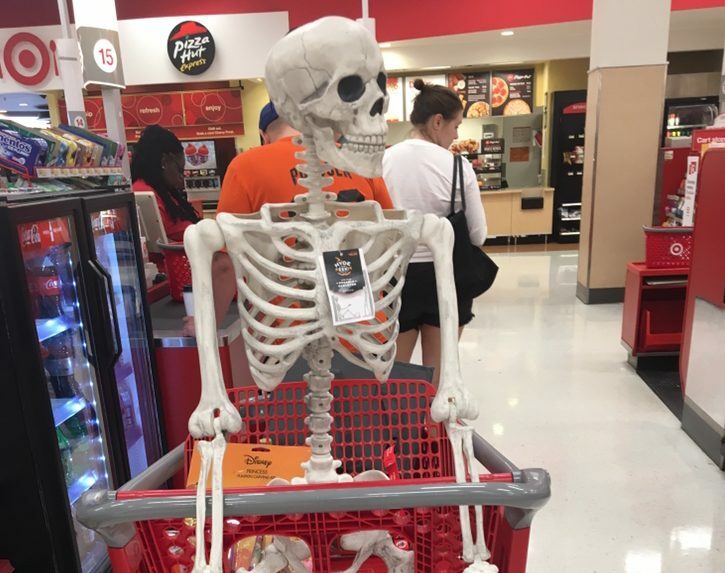 This is how we left target with a skeleton in our cart. When we got home, my daughter promptly fed him with plastic food and proceeded to give him a full doctor’s check up with X-rays (I know, the irony). A few days later, I got a giant spider to accompany him and some bats to decorate the porch. Last weekend we went to the pumpkin patch, brought home a hay bale and carved a jack o lantern. Yes, I now know, I should have waited to do the latter. Our jack o lantern rotted within days and created a fruit fly infestation on our porch. In its place now in is a small bowl of apple cider vinegar and dish soap to kill the gnats. We snuggled up on the couch and watched the Disney movie, Coco. Then we ordered a costume for our golden retriever, Jack, who will also be a Unicorn. I can only imagine what my mother would have said to that.